Four killer SEO best practices to instantly surge your video traffic! This post will describe in simple easy terms how to use basic seo best practices to boost search engine ranking and massively increase traffic from your videos. One of the most common mistakes amateurs make when they upload a video is to forget seo best practices...even the most basic SEO for that matter. You should remember that not paying attention to video SEO has the same effect on on traffic that ignoring SEO for a common text-based page has! There lies the biggest problem: despite video SEO being just as easy (or easier) as "regular" SEO, the basic search engine ranking work needed for video content just isn't being done. That's also the opportunity: it's far easier to use basic SEO marketing techniques to boost your video search engine ranking across the major search engines than boosting ranking for an ordinary text page. Many don't understand that unlike the way search engines rank a text based page, search engine ranking today is "blind" when it comes to automatically contextualizing, categorizing, and indexing video content. So just as with an ordinary text webpage, search engines rely on the same titles, descriptions, and tags that to determine the search engine ranking for a video page! Search engines today are expert at making sense of non-optimized text-based webpages (given that a non optimized text-based page at least has text-based keywords in it...among many other useful attributes). All to say, video content however is far more enigmatic and must be decoded or "unwrapped" by a search engine to in order to properly categorize and determine search engine ranking. The good news is, optimizing your video for search engines is just like optimizing SEO for your website and blog copy...in some senses a lot easier! Below you'll quickly learn that the best SEO best practices for text media can be utilized for video media. That's all to say that the same methods you use to determine what key words and phrases people will use to search for your web pages and blogs you'll use to determine the keywords and phrases in your title, metadata, and page description of your videos. ​This brief tutorial reminds us that if you want high traffic to your video then it's absolutely essential you leverage popular high-traffic sites that have already partitioned (or make it simple for you to partition-out) demographic "lookalikes" on their site for you to target. A lookalike is a visitor on another site with the same basic demographic composite as the visitors to your site. All you have to do to tap into those massive pools of potential visitors is to get their attention! The link below shows you how you can target your demographic in search engines with feeds and links which will, if done right, shuttle traffic from these high traffic sites over to your video page (or serve up the video directly to them by embedding or other means). One such site with a massive and demographically diverse rushing river of traffic to target is Pinterest.com. ​The following one-page tutorial assumes you understand how absolutely critical relevant keywords are in determining rank on all major search engines. It goes further and delves into the simple mechanics of optimizing your video for specific search keywords. So, for instance, when you first upload your video onto youtube.com or vimeo.com the existing filename on that video becomes the video name by default. Almost always those video file names aren't optimized for search engines. As an example, your video filename might be “video_01.mp4” once uploaded to youtube.com; this link will show you how to optimize titles and the rest for video SEO best practices, so your uploaded video might instead read "Danes Body Shop Austin TX - personalized coaching gym pricing.". The following is one of the broadest and most comprehensive one-page tutorials that'll show you everything you need to know to get your proverbial "associate's degree" in online video SEO marketing. This sweeping instructional covers Titles​ ​an​d​ Descriptions, Tags and Categories, the increasing​ ​importance of Transcription (transcription of the audio/voice within the uploaded video itself) to video SEO marketing now, as well the importance of securing solid traffic right out of the gate to help boost the SEO rank of your uploaded video. They also cover thumbnails, embedding, analytics, and all the rest! 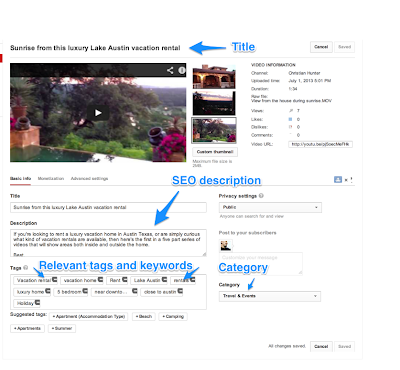 Read on to check your knowledge of SEO marketing on Youtube and Vimeo before you upload your next video online! Below are a number of additional educational resources you may find useful in your video SEO best practices marketing and traffic generating efforts. Do you have any good ones? If so, please add in the comment section below! Thanks to you both. Excellent link Marry Thomas, thank you. I think I'll follow up this post with some enhancements I've since come to learn about by experience and helpful posters like yourselves!